In WHO IS BLUES Vol. 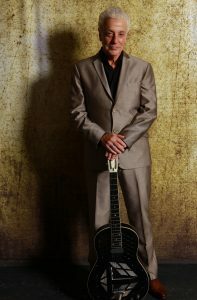 1: Doug MacLeod, Doug MacLeod reveals how he overcame an abusive childhood to become a celebrated singer, songwriter and master of the blues guitar. The book traces the highs and lows of MacLeod’s six decades in music. From St. Louis to the coffeehouses of hippie-era Norfolk. From the backwoods of Toano, Virginia to the rough-and-tumble blues clubs of 1970s Los Angeles. From his electric LPs of the 1980s right on up to the recording of 2018’s Acoustic Album of the Year Break The Chain. Along the way, he shares recollections of contemporaries like Albert King, B.B. King and his mentor George “Harmonica” Smith. His inspirational story is one of friendship, forgiveness, family and the great and mystical healing power of the blues. Check out the book trailer (and get a taste of Doug’s music) HERE. WHO IS BLUES Vol. 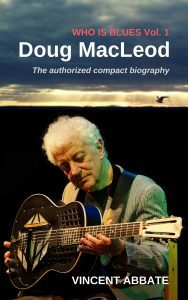 1: Doug MacLeod is available via Amazon.com, Amazon UK, Amazon Germany and all other national Amazon sites.